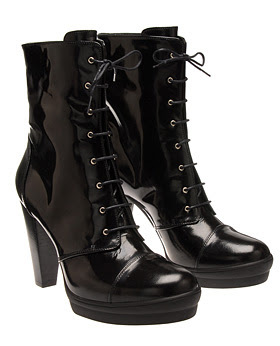 The lovely WendyB recently tried these gorgeous Dr Marten boots, but alas, without success. I loved them as soon as I saw them, but they don't have them in an 8, sigh!! But a quality gorgeous boot for the money for anyone else looking for that perfect winter boot!! I'm just not a doc marten girl at all but I can see the appeal - talking of Browns you try going to college everyday with their b****y store opposite - gosh temptation city or what so far I've only messed up thier pristine window with my face! 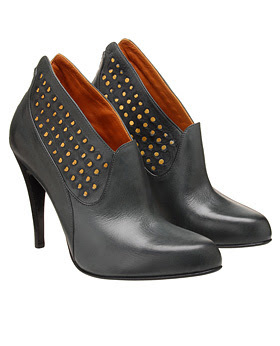 oh the studded pair are to die for. and I am just speechless on the last pair. MMM can do no wrong! my heart is my mouth right now! love the Margielas far too much!!! 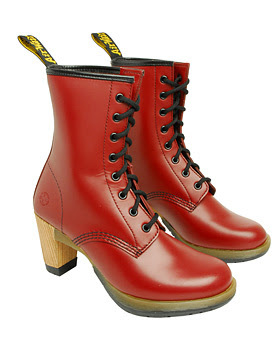 adore the red Dr Martens and the Fendis...was love at sight! hmm i dont know about the first pair but im in love with the other 3! Hi kate-oh, what temptation for you, dearie me!! I went on the website earlier and fell in love with lots! Hi nv-thanks my dear and these are my favourite pairs as well! Hi janettaylor-oh me too my dear!! Hi sam-thanks for stopping by, yes, I love them all! Hi dana-I was smitten with the Dr martens too, such a gorgeous boot for the money! Hi marian-oh, the Browns website is fabulous, if you love these boots, you'll adore their other stuff! have a lovely weekend! Hi emma-oh, I love them all, haha!! Hi saray-I agree, they're all soo gorgeous!! Hi S-I know, I want them too, haha! Now you have me wanting those Fendis boots! Hi Wendy-they are soo gorgeous and will go with anything and everything!! Hi ladies who lunch-oh I love them-I think I would have been even more tempted if they were in black too! The golden goose are amazing! Want them now!! Thank you for your lovely comments, it was amazing meeting Dita Von Teese, she was a real class act! !Have a great weekend! Hi Silje-I adore the Golden Goose ones too!! yes, what an amazing time you had my dear, hope you have a great weekend as well! The Golden Goose ones are awesome! Doc Martens LOOK awesome too but they're really uncomfortable ^^ Well, the old ones are, in any case. Maybe the new ones aren't. wow that last pair is awesome! The Dr Martens are sooooo cool! Do they have it also in black like the regular ones? 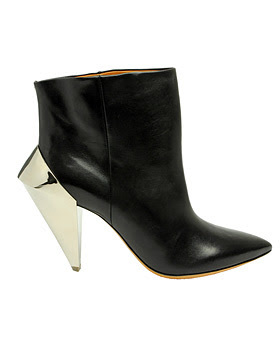 My vote goes for Martin Margiela! i heart the last one! Hi Cate-I adore the Golden Goose ones too! I was wary about the Dr Martens for this reason too, not sure if the new ones are more comfy or not!! Hi ren-I know, soo gorgeous!! Hi Couture Carrie-I agree, I love them! Hi the stiletto effect-yes, a website called www.cloggs.co.uk do them in black patent-swoon!! Hi acielle-yes, they're fabulous! have a lovely weekend my dear! Hi oddgirldiaries-haha, lucky you about the weather then! Hi song of style-thanks for stopping by my dear! Hi Sharon! Yes, the English exam went well! Thanks for asking! (At least, I think it went well, but I think it did, becuase English is usually my best subject...) And thanks to you I now know that the style of jacket is called a swing jacket - thanks! in theory, MMM is cool but I will prob ending up with Fendi instead. Hi cate-so pleased for you my dear, well done! Hi savvy-yes I love the MMM ones, but the Fendi ones look more wearable!! Squeak! I love those Dr Martens! Never seen them with a heel before. Back from hols now; thanks so much for your guest post. It has been drawing lots of hits! Hi miss thrifty-oh so welcome my dear, hope you had such a fabulous time!! Hi a pot, a thought & a smidgen of dirt-yes, they're great!! Hi nikkimoose-thanks for stopping by! !